Could Stonehenge tunnel be ‘sacred version’ of Twyford Down? John Whittingdale MP, newly appointed Secretary of State for Culture, Media and Sport, is known to be a supporter of archaeology and our cultural heritage. He has in the past been critical of the low priority the Government has traditionally given to our historic environment. With this record in mind, we hope that he will wish to ensure that proposed ‘improvements’ to the A303 will not give rise to further damage to the Stonehenge World Heritage Site. The editor of thePipeLine’s blog Whittingdale ‘gets’ heritage shock wonders whether David Cameron and George Osborne know what they are getting with a Secretary of State who actually understands heritage and archaeology and the legal and financial resources the sector requires. ‘Mr Whittingdale may well find his knowledge of what the sector needs coming hard up against the neo-liberal, economics his Government espouses . . .
‘Along with all Mr Cameron’s other Ministers, Mr Whittingdale will also have an eye to predicting and avoiding the kind of issue which can come out of nowhere to blindside a Government with some sudden and unfortunate PR disaster which would exercise back bench MP’s and the Conservative Press . . .
‘The Government appears to favour a shorter and consequently cheaper tunneling option, which now appears to have been supported by both the National Trust and English Heritage in spite of the fact it would damage the landscape of the World Heritage Site [WHS]; whereas the Stonehenge Alliance, supported by the Campaign to Protect Rural England and RESCUE advocated a position which would protect the entire land take of the Stonehenge World Heritage Site in December 2014. The Stonehenge Alliance firmly hopes that John Whittingdale will remind Government of its World Heritage Convention commitments and introduce a proper understanding of what would be right for our most famous World Heritage Site. If you object to the road proposal through the Stonehenge World Heritage Site you can take three quick actions: sign the petition, write to UNESCO and write to the National Trust. 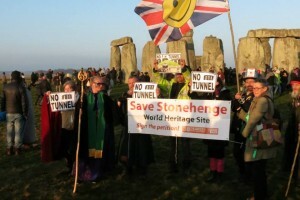 Modern Druids crowd round Stonehenge Alliance banner at sunrise during the celebrations of the Spring Equinox, 2015.